Ant and KayCee love cherries. They especially love fresh cherries and now’s the time to enjoy the different varieties that are available while they’re in season. 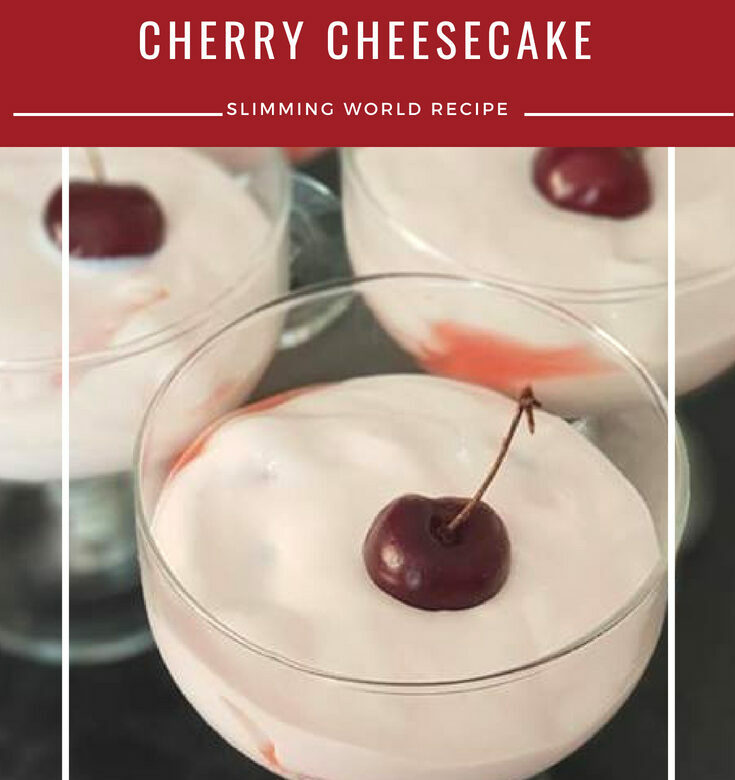 I used a punnet of fresh cherries to make this Cherry Cheesecake Slimming World recipe so I could enjoy them as well. I’m not as big a fan of cherries as Ant and KayCee are but they make a nice change. Those 2 would eat them fresh or cooked in a cherry pie every day if they could! I didn’t know that cherries are full of vitamin C and melatonin which helps promote healthy sleep patterns. They’re also full of anti-oxidants so they’re a really good fruit for children and adults to snack on. Unfortunately, you can’t see the biscuit layer in my pictures because these dishes have a wide base and it would add more syns if I used more biscuits! Put the rest of the water in a small pan with the orange juice and 1 teaspoon of sweetener. Bring to the boil over a high heat then stir in the arrowroot paste until thickened. Return to the boil, add the cherries and simmer for 3-4 minutes or until the cherries have softened slightly. Set aside to cool. Divide the amaretti biscuits between four 200ml jars or dessert glasses and spoon a few cherries and some of the syrup into each one. Put 250g of quark, the yogurt and the remaining sweetener into a bowl and whisk until smooth. Stir in most of the cherries and the syrup, divide between the jars or glasses and smooth the tops. Chill for at least 15 minutes. Meanwhile, dry-fry the almonds in a pan over a high heat for 1-2 minutes or until just golden. Top the jars or glasses with a dollop of the remaining quark and spoon over the remaining cherries and syrup. Scatter over the almonds and decorate with whole cherries to serve.